Well, technically we all have a diet. If you eat food, you have a diet. That’s not the same as being on a diet, which is what most of us think of when we hear the word “diet”. It has become a 4-letter word to avoid! Okay, so what does that mean? Diets are a self-imposed period of food deprivation, and it’s usually a restriction of your very favorite foods too. Not just any foods (although don’t some fad diets seem like someone just randomly chose foods from a list?). What happens when you are “done” with your diet? …Well then you go back to normal, right? You go back to eating those foods that you love, food that you enjoy- but do you actually enjoy eating it? Or do you feel guilty about it, waiting until the next diet to begin, to “get back on track” which we seem to think means avoid foods that we love? So begins the cycle of being on and off of a diet. Guess what, it’s not even effective! The cycling of weight loss and gain is actually detrimental to our health, and research has shown that weight cycling is a contributor to cardiovascular disease, diabetes, and other preventable diseases. And the multi-billion dollar diet industry is encouraging low self-esteem and poor body image. Let’s truly enjoy the foods we love. Let’s honor our body’s signals of hunger and fullness.Let’s eat the variety of tastes and textures our body naturally craves. Let’s accept that every body comes in different shapes and sizes. Let’s give up dieting for good! You’re probably thinking it sounds pretty good- freeing! Maybe it sounds a little more challenging or even scary. Of course it does, maybe you’ve been dieting for years or even decades. So how do you give up dieting? The process certainly takes a little longer than following a tidy meal plan but real life isn’t tidy and easy- real life is messy! It takes a little more work to restore the healthy relationship with food we once had. It may have been a while since the last time you honored your hunger and fullness or even truly enjoyed your favorite foods. But the hard work is so worth it! Work with a Registered Dietitian who specializes in a non-diet approach to health and wellness to give up dieting for good. A Registered Dietitian can help clear up all the confusing and conflicting information out there about fad diets, and help you on the journey to restoring your relationship with food. Start today! 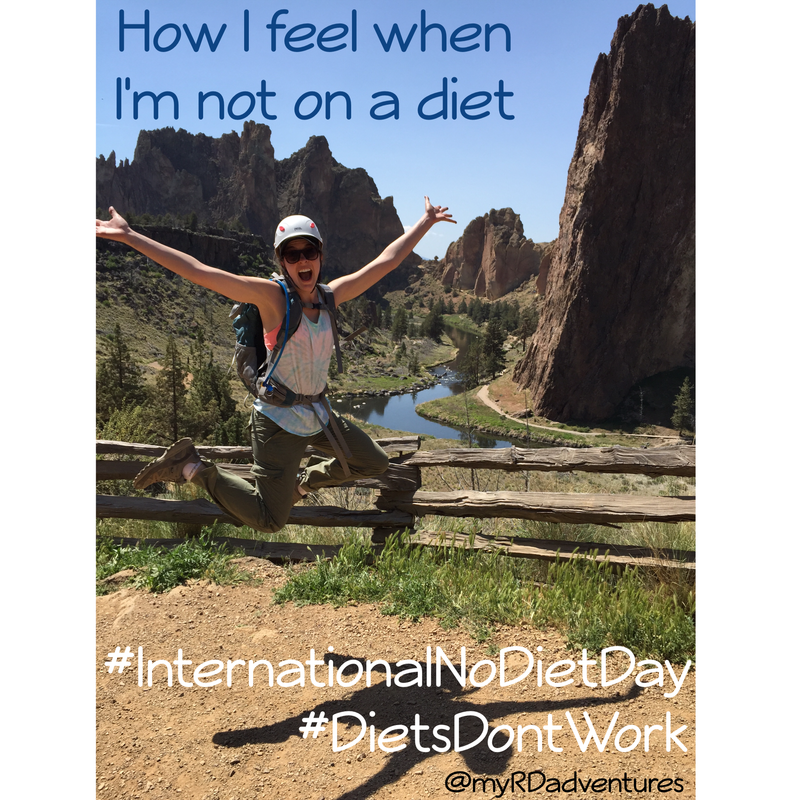 How will you celebrate International No Diet Day? This entry was posted in Health, Mindfulness, Nutrition, Uncategorized, Wellness and tagged dietetics, dieting, dietitian, Healthy Lifestyle, international no diet day, intuitive eating, mindful eating, no diet day, nutrition, Registered Dietitian, wellness by Amanda Field. Bookmark the permalink.